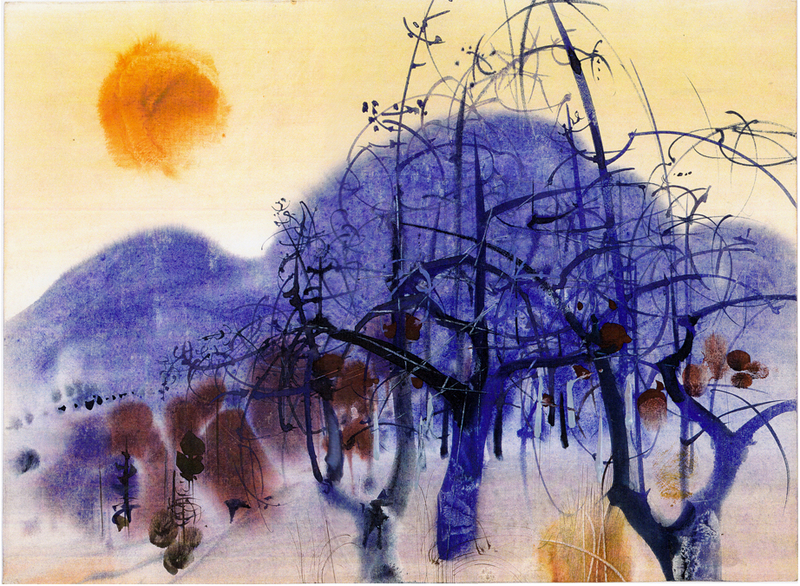 If you look up the works of Mirko Hanák on Wikipedia, you may think you are seeing classic Chinese watercolor masterpieces – If you look up actual classic Chinese watercolorists, you may agree with me that this Czech artist was even greater! But you may wonder why I hired a Czech artist, working in his clearly Chinese influenced style, to design my projected feature animation film of E.B. 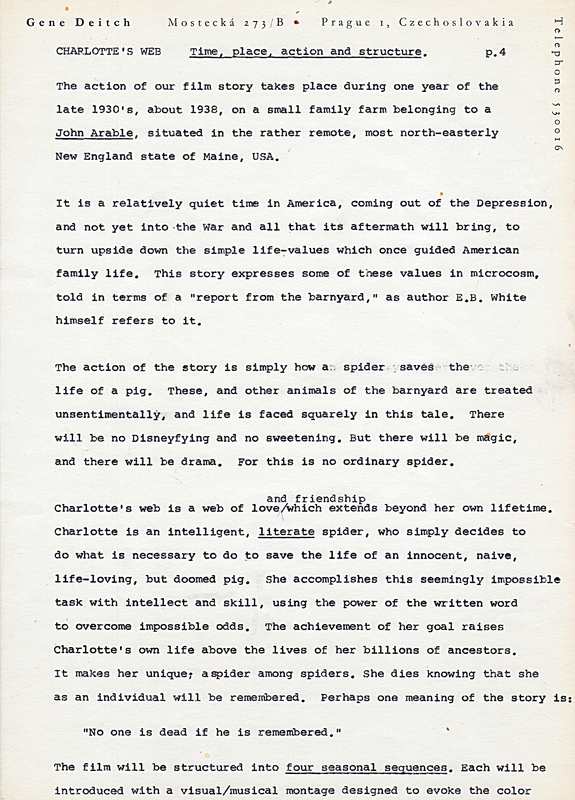 White’s very American story, “Charlotte’s Web.“ You will now have a chance to decide if I made a wise choice. 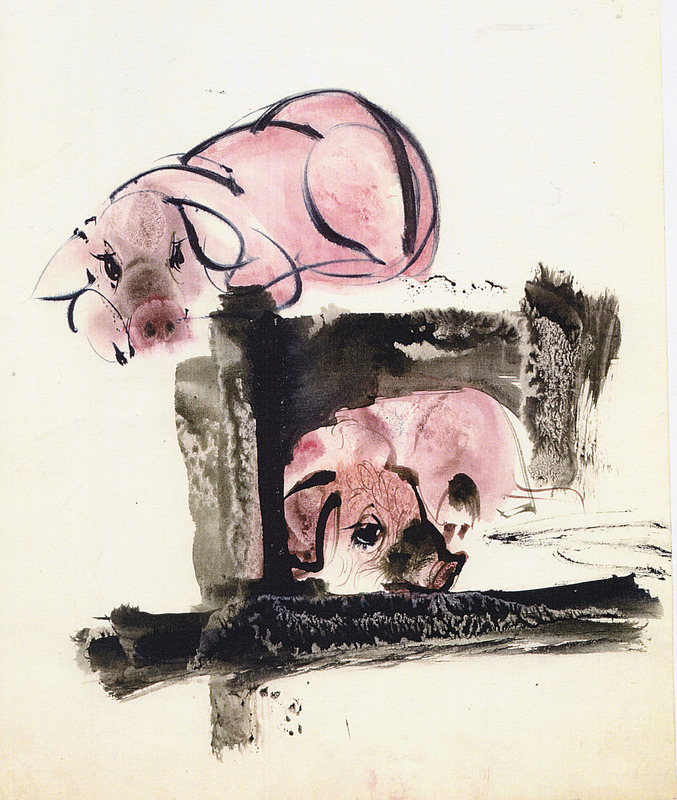 My gamble was based on Hanak’s sensitive, poetic mastery of drawing – animals, humans and landscapes – with a magical vision. Charlotte’s Web is a magical story in a seemingly realistic setting. Could these two visions be fused? I felt that with the right research, and guidance, an artist of Hanak’s skill and perception could draw and paint what I envisioned for this movie. My dismay, just one year later, was that this unique artist was brought down in his prime by leukemia, at age 50, adding the most tragic blow of all to that ill-fated project.. Hanak’s brilliant storyboard visualiztion of Charlotte’s Web was his final work! Even if I‘d had a go-ahead from my client, who in the world could have matched Mirko Hanak? I will insert here just a few examples of Hanak’s brilliant illustrations from his books and calendars. If you check out Mirko Hanák on Wikipedia you can see a breathtaking array of his work, and if you take the time to study or even to just flip through Hanak’s storyboarding of my Charlotte screenplay, you will surely imagine how gorgeous our film might have been, and perhaps feel the same frustration and remorse as I do, that the opportunity was fatally snatched away from us. Not that it would have been easy to animate – especially in the film technology that existed in 1971, (or even today!) I did have some technical ideas, and no expectaions of Disney-style animation. but with deft camera, rich music, motioneffects, I did believe I could create a beautiful and evocative film. Nothing like what Hanna-Barberra did, or what had been done in the early 1970s! If you have the time or interest to study my adaptation, you will see that I did take many liberties with Andy White’s book, combining charactes and locations, doing much trimming, but I think always in the spirit of and respect for the intentions of the original. I believe that in spite of the liberties I applied, condensing, and filmic adaptation, that I was faithfully adhering to the meaning, spirit, and truth of his book. My scenario may have upset Andy. For example, I eliminated the Zuckerman family, but I hoped to convince him that the essence of his story works with just the Arabels; easier to follow., and would make the film do-able within the 90-minute length limit I was ordered to maintain. But of course all of that is academic now. I am only hoping that by finally revealing what I attempted 42 years ago. It will be worth looking at now as an artifact of animation history. Certainly, the evocative design rendition by Mirko Hanak needs to be unveiled and preserved as a genuine work of art. He was amazing to work with. From his classic illustrations, I believed that he could somehow deal with personality, humor and emotion. Just look how his storyboard sketches, quick and facile as handwriting, conveyed character, atmosphere and mood! He was an amazing artist, incredibly knowlegable in animal and human anatomy, able to instanlty create storyteling sketches of characters, location, and atmosphere! 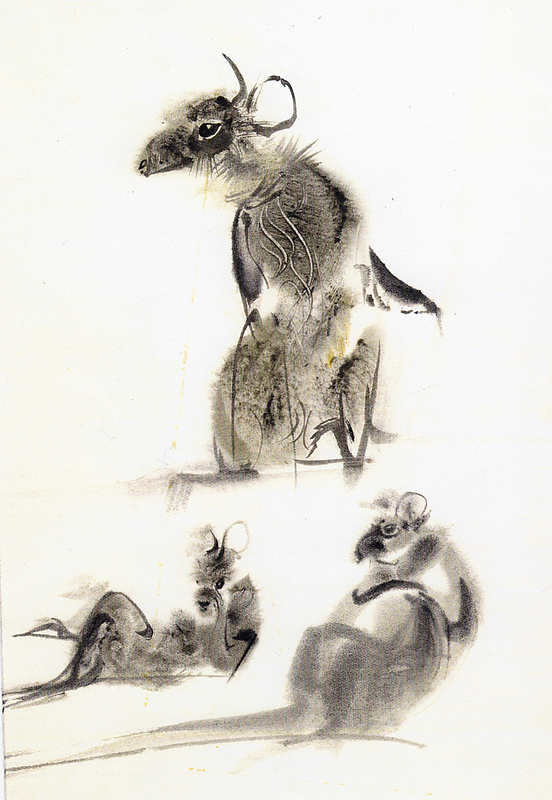 He was a fully mature artist at age 50,. The Charlotte’s Web character sketches, trial background paintings, and complete storyboard were his very last work! His early death at age 50 was a tragic loss to the world of art and illlustration. The earlier decision of the producer to go elsewhere was made made without their ever seeing Hanak’s work. His death was just an added nail in the coffin of the project. Whatever you may think of my 1971 screenplay adaptation, the deviations and condensations I made, I believe you must admire the artistry and graphic skill that Mirko Hanak could have brought to my proposed production. So after 42 years of lying in a sealed box in my studio, even with the realization that is a dead issue as far as ever being produced, i am bringing out the long-hidden storyboard at last for whomever of you will find it interesting enough to study. If you haven’t read my E.B. White chapter 39, you may want to read it now for the full picture of this brutally terminated project! 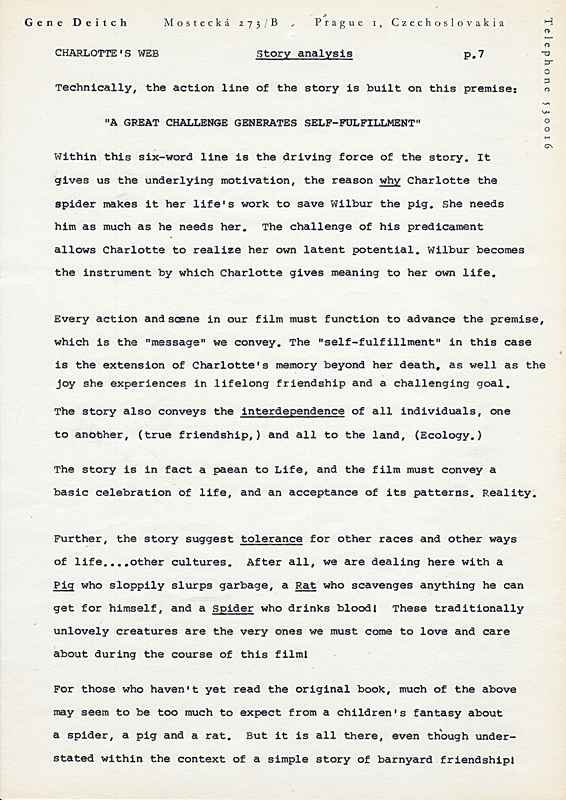 After being rejected sight-unseen by Sagittarius Productions, who had secretly made a deal with Hanna-Barberra, and also that it was never seen by E.B.White, who had taken the money from Sagittarius and given up his rights, you will in fact be he first to see this 42-year-hidden storyboard! The other principals are dead and gone., so I feel I now have the right and duty to show it, without upsetting any of them. Andy White never knew what hit him until in his weak and dying condition he saw the Hanna-Barberra film and was devastated by it. It was only after I was cut out of the project that I was able to send him the model drawings and preliminary illustrations by Mirko Hanak, He loved them and was as dismayed as I was at the H-B version.. I have every confidence that he would have loved my film, and appreciated my fidelity to his story. But who knows? 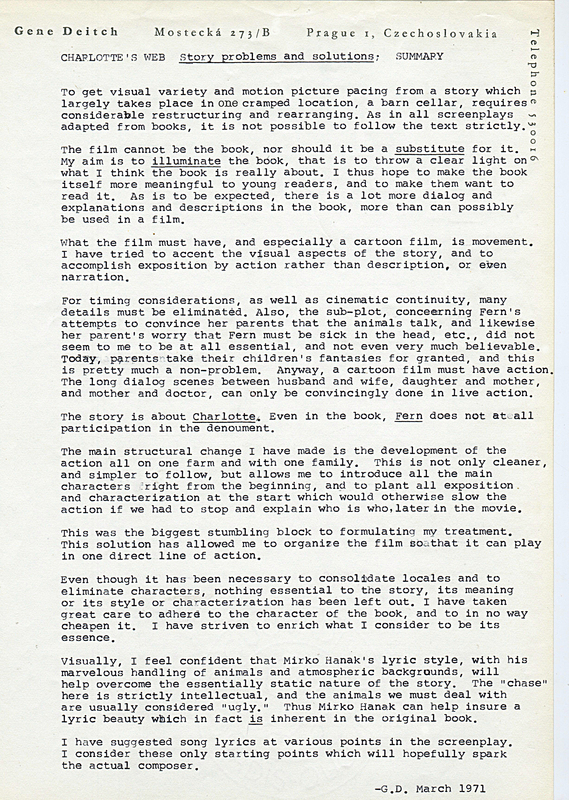 In addition to all of this, I also have my complete 104 page typed screenplay, plus 24 pages of introductory background information, synopsis, book analysis, structure, adaptation problems and solutions, guiding premise, character motivations, general thoughts and ideas for action development, suggested bits. etc. Perhaps these 24 pages of notes and thoughts will be more interesting to fellow filmmakers than the actual screenplay itself! Here are three selected pages to help you understand my decisions in constructing the storyboard. I dedicate this „Credit“ to the memory of a great artist, Mirko Hanak. Thank you for sharing. So sad that he passed away and your project did not come to fruition. The storyboard is stunning, so fitting to E.B. White’s wonderful story. Thank you, Elle, for your appreciative comment! I am so lucky to have stumbled across this site and can only imagine the possibilities Hanak could have done with his beautiful illustrations and storyboard for Charlotte’s Web. Gene – Thank you so much for posting this – it can be really hard to find archives of Hanak’s work – which is so unfortunate, his talent is incredible! I wondered if you had any idea what sort of paper that he was using to paint on? The only information I can find online says rice paper – but from his markings it’s clear he wasn’t using such an absorbent surface. I know even the sized/treated chinese papers don’t quite work that way – just wondered if you had any clarifications on his media choice? Thank you so much for your time and consideration of my question – and thank you again for making this available!! It was at the time very difficult to get proper water color paper here, but I think Mirko was in a position to get what he needed.We jfinanced his needs, howevewr, I never specifically asked him what he was ordering.. I was just thrilled to be getting such brilliant art from him! 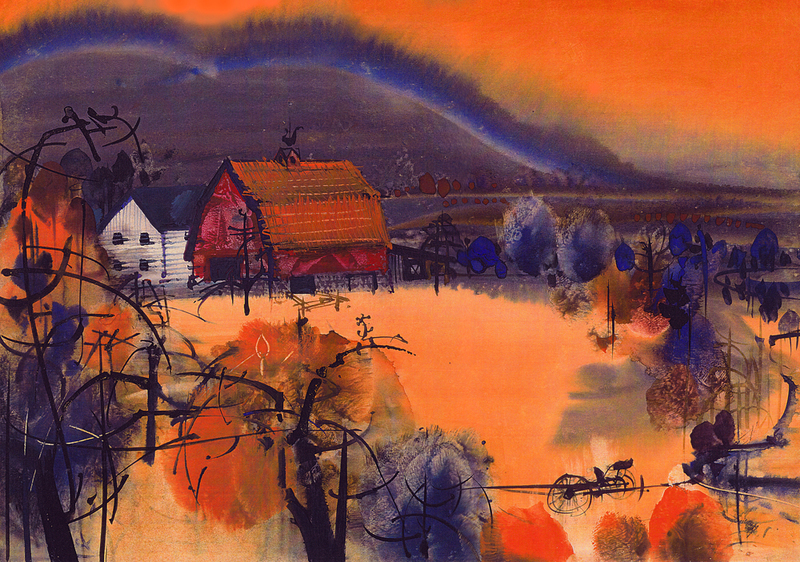 Gene, these watercolors and storyboard drawings are stunning. His pen and ink sketches have such sensitivity, very fitting for the story. I can even imagine the storyboard with a voiceover and music working simply as a short film. 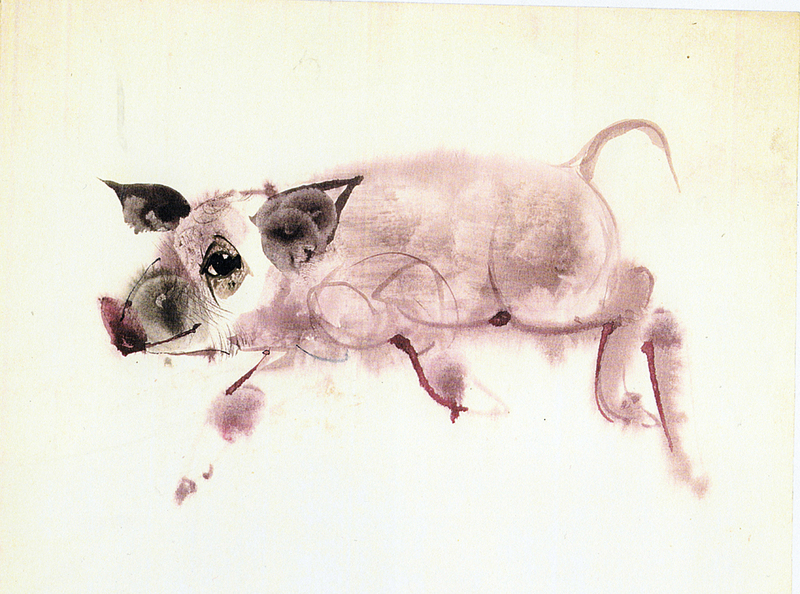 I also thought of John Hubley when I saw the watercolors and the rat drawings. A feast for the eyes, really. Thank you for allowing us the honor of seeing these beautiful drawings after so many years. Even though it’s tragic that he died so young Mirko Hanák must have felt great joy to work on this project with you. I hope you take some comfort in that, Gene. 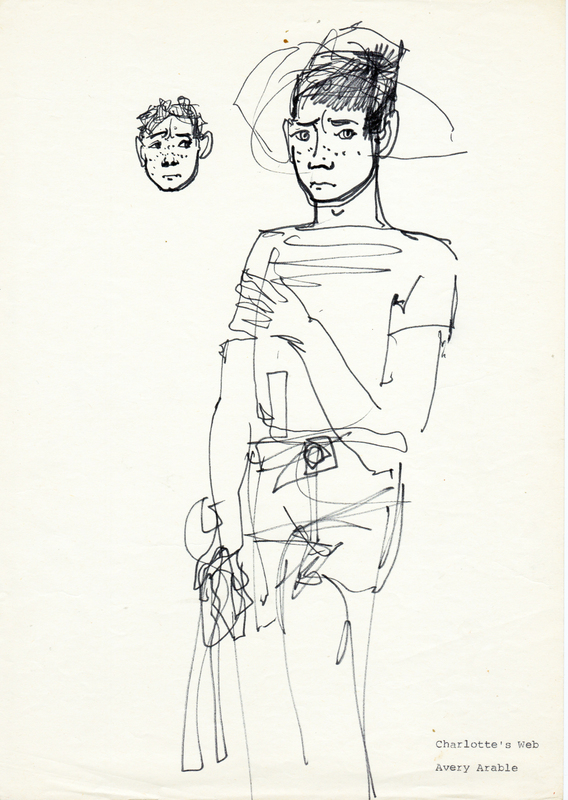 Replying to my own comment, gee… Looking at the illustrations above, one name kept popping up: John Hubley. He could have made a film that looked like those drawings. It’s a shame you didn’t get a chance to realize this project. Yes, Hub had a contract with E.B.White earlier than I did, but he couldn’t get financing, and his option ran out. It was then that Mike Campus met White, and proposed me to give it a try.